Illustrated. 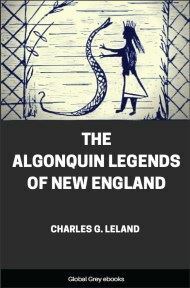 This is Charles Lelands' able retelling of the Algonquin mythology, particularly tales of the culture hero, Glooskap. 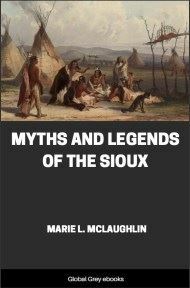 Parts include; Glooskap The Divinity; The Merry Tales of Lox, The Mischief Maker; The Amazing Adventures of Master Rabbit; The Chenoo Legends; Thunder Stories; At-o-sis, the Serpent; The Partridge; The Invisible One; Story of the Three Strong Men; The Weewillmekq'; and, Tales of Magic. AMONG the six chief divisions of the red Indians Of North America the most widely extended is the Algonquin. This people ranged from Labrador to the far South, from Newfoundland to the Rocky Mountains, speaking forty dialects, as the Hon. J. H. Trumbull has shown in his valuable work on the subject. Belonging to this division are the Micmacs of Nora Scotia and the Passamaquoddy and Penobscot tribes of Maine, who with the St. Francis Indians of Canada and some smaller clans call themselves the Wabanaki, a word derived from a root signifying white or light, intimating that they live nearest to the rising sun or the east. In fact, the French-speaking St. Francis family, who are known par éminence as "the Abenaki," translate the term by point du jour. The Wabanaki have in common the traditions of a grand mythology, the central figure of which is a demigod or hero, who, while he is always great, consistent, and benevolent, and never devoid of dignity, presents traits which are very much more like those of Odin and Thor, with not a little of Pantagruel, than anything in the characters of the Chippewa Manobozho, or the Iroquois Hiawatha. The name of this divinity is Glooskap, meaning, strangely enough, the Liar, because it is said that when he left earth, like King Arthur, for Fairyland, he promised to return, and has never done so. It is characteristic of the Norse gods that while they are grand they are manly, and combine with this a peculiarly domestic humanity. Glooskap is the Norse god intensified. He is, however, more of a giant; he grows to a more appalling greatness than Thor or Odin in his battles; when a Kiawaqu', or Jötun, rises to the clouds to oppose him, Glooskap's head touches the stars, and scorning to slay so mean a foe like an equal, he kills him contemptuously with a light tap of his bow. But in the family circle he is the most benevolent of gentle heroes, and has his oft-repeated little standard jokes. Yet he never, like the Manobozho-Hiawatha of the Chippewas, becomes silly, cruel, or fantastic. He has his roaring revel with a brother giant, even as Thor went fishing in fierce fun with the frost god, but he is never low or feeble. Around Glooskap, who is by far the grandest and most Aryan-like character ever evolved from a savage mind, and who is more congenial to a reader of Shakespeare and Rabelais than any deity ever imagined out of Europe, there are found strange giants: some literal Jötuns of stone and ice, sorcerers who become giants like Glooskap, at will; the terrible Chenoo, a human being with an icy-stone heart, who has sunk to a cannibal and ghoul; all the weird monsters and horrors of the Eskimo mythology, witches and demons, inherited from the terribly black sorcery which preceded Shamanism, and compared to which the latter was like an advanced religion, and all the minor mythology of dwarfs and fairies. The Indian m'téoulin, or magician, distinctly taught that every created thing, animate or inanimate, had its indwelling spirit. Whatever had an idea had a soul. Therefore the Wabanaki mythology is strangely like that of the Rosicrucians. But it created spirits for the terrible Arctic winters of the north, for the icebergs and frozen wastes, for the Northern Lights and polar bears. It made, in short, a mythology such as would be perfectly congenial to any one who has read and understood the Edda, Beowulf, and the Kalevala, with the wildest and oldest Norse sagas. But it is, as regards spirit and meaning, utterly and entirely unlike anything else that is American. It is not like the Mexican pantheon; it has not the same sounds, colors, or feelings; and though many of its incidents or tales are the same as those of the Chippewas, or other tribes, we still feel that there is an incredible difference in the spirit. Its ways are not as their ways. This Wabanaki mythology, which was that which gave a fairy, an elf, a naiad, or a hero to every rock and river and ancient hill in New England, is just the one of all others which is least known to the New Englanders. When the last Indian shall be in his grave, those who come after us will ask in wonder why we had no curiosity as to the romance of our country, and so much as to that of every other land on earth. "Where analogies are so general, there is a constant liability to mistakes. Of these foreign analogies of myth-lore, the least tangible, it is believed, is that which has been suggested with the Scandinavian mythology. That mythology is of so marked and peculiar a character that it has not been distinctly traced out of the great circle of tribes of the Indo-Germanic family. Odin and his terrible pantheon of war gods and social deities could only exist in the dreary latitudes of storms and fire which produce a Hecla and a Maelstrom. These latitudes have invariably produced nations whose influence has been felt in an elevating power over the world. From such a source the Indian could have derived none of his vague symbolisms and mental idiosyncrasies which have left him as he is found to-day, without a government and without a god."